Open Command Window Here in Windows Explorer – this is COOL! OK here’s something cool I learnt at TechED AU. In Windows Server 2008, in Windows Explorer, if you hold down the Shift key and right click on the content listing of a folder (i.e. 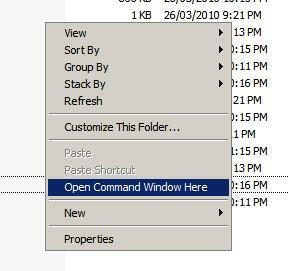 the right pane), you will get a new “Open Command Window Here” option in the context menu. Yes yes there are some shell extensions out there that you can install to get this without having to hold down Shift, but this is nice in environments where you are not allowed to install stuffs. 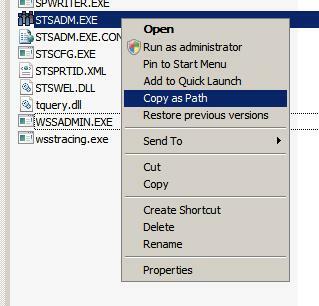 Also, if you do the same thing on a file, you will get a new “Copy as Path” option in the context menu :D.
Apparently this works on Vista, so hopefully it works on Win7 as well, but I have not had a chance to try it on these OSes. This entry was posted in Windows Server 2008. Bookmark the permalink.